Pune, 2nd February, 2017: Starkenn Sports Pvt. Ltd. in association with Rotary Club of Pune Smart City and Kotak Mutual Fund is organizing a ‘SMART CYCLOTHON’ in Pune. This 23 KM bicycle rally will commence on 5th February, 2017 at 6.30 am from Sangamwadi Bridge near RTO. This first of its kind bicycle rally for a smarter and greener Pune will see participation of people from different walks of life. Elite riders, common citizens and cycle enthusiasts from the city are participating in this ride. This bicycle rally is powered by Kotak Mutual Fund & Exelon Basket. Mr. Pravin Patil, MD & CEO, Starkenn Sports. Pvt. 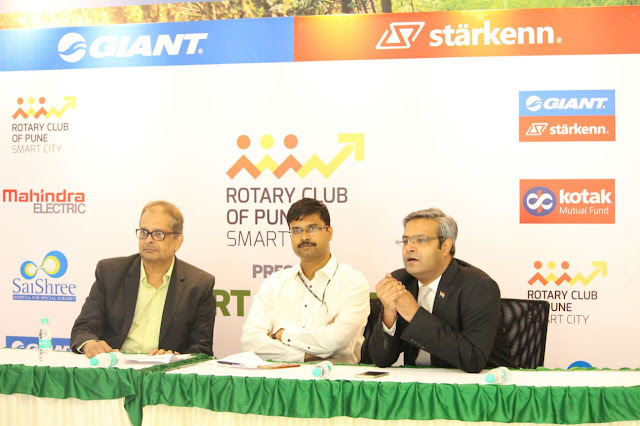 Ltd and Jaideep Parekh, President Elect., Rotary Club of Pune Smart City addressed a press conference today to announce this initiative. Ultimate aim of ‘SMART CYCLOTHON’ bicycle rally is to promote active and alternative transportation towards sustainability and engage families and the entire community. The idea behind this bicycle rally is to create an awareness about the need of pollution free commutation and promote Pune’s forgotten cycling culture. Online registrations for the CYCLOTHON are open till 4th February, 2017. Cycle enthusiasts can enroll on https://easebuzz.in/link/JC7CT . Registration fee for the CYCLOTHON is Rs 200/-.